Did you read the following page Buying Tips? I wrote it in view to western people buying from Chinese and western dealers, but some of it may apply to your situation. You are in Kalimantan? A collector whom I trust and who spent considerable time in Indonesia says that 20 years ago genuine Chinese antiques were plenty, and very affordable, but that it is difficult to get genuine ones now. So, please be careful. I have a similar situation here. When I started collecting in Taiwan I originally bought much of my "antique" porcelain here - until I discovered that it is easier to buy genuine antiques online (from reliable buyers in certain countries). They may cost a bit more, but in the end I spend less than I would for the fakes here, and that have little or no value. Thanks Peter, before I posted this picture on your website, I told the seller that his so called antiques are fake...but he's laughing at me and telling me that I know nothing about chinese antique (which is true), but now, since you convinced me with your opinion and your knowledge (that have same conclusion with me), I have little bit confidence. 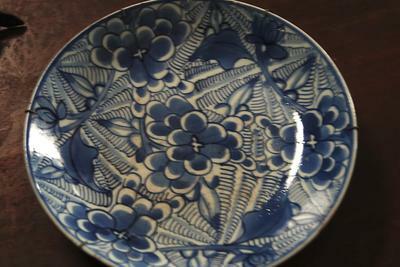 The plate design is a specific floral design popular in the Kangxi era. However, this one looks crude when compared to the genuine Kangxi era item (possibly also Shunzhi). Many are plates or chargers, not small dishes. Unless this is very small, that is 10-12cm at the most, it is unlikely that the details (petals) are so big in this decoration. The hanger seems to indicate that it is larger. 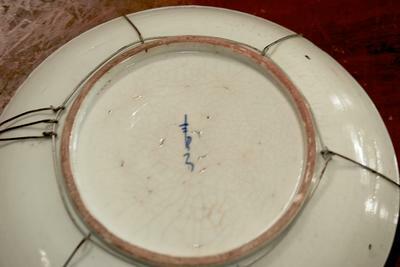 The mark resembles certain Dehua kiln marks (it certainly does resemble Japanese marks) because they are two character marks, one written on top the other below. - a peculiarity among Chinese marks. However, in Chinese this mark does not look like proper characters either. Mostly the character 和 would be legible, at least, with a Dehua item. Actually, the mark looks more as if it were copied by someone who doesn't know any Chinese. You see that sometimes on SE Asian fakes. I do not know much about Chinese porcelain yet but I am learning. From what I have seen doing extensive research, that mark seems to be Japanese. It could be Imari. I am not an expert but that much I can tell you. Good Luck!